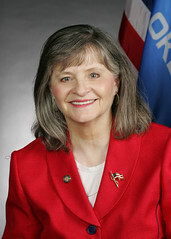 I find it unusually discouraging that Oklahoma City-area state Rep. Sally Kern, the nationally known gay-hate activist, has found solace in the Oklahoma House from her GOP colleagues for a paranoid, conspiratorial bill that attacks the United Nations and the world community. I know the GOP owns state government right now, but why does it waste its time with the nonsense of Kern and other extremist Republicans who push crazy, needless legislation year after year? By supporting such legislation-I’ve written about the “crazy” issue here and here and here and elsewhere many times-conservatives actually miss opportunities to enhance the integrity and power of their political party. Oklahoma conservatives who might reasonably push for reasonable change-despite progressive and overall Democratic opposition-lose credibility when they don’t speak out against the craziness. The GOP has a clear majority and voter mandate in Oklahoma, and it’s wasting it on extremism and just plain weirdness. It also appears now the GOP can’t even get a small tax cut through the legislature this session-an effort I adamantly oppose because of recent budget cuts-or have a serious discussion about taxes in general, but, well, it can sure take time to reward the extremist Kern with a lopsided vote in her favor. In a way, that’s good news for the state’s Democrats because eventually the conservative extremism will fall in on itself and the GOP here seems intent on making that happen sooner rather than later, but it’s a painful, ugly and embarrassing process. I’ve written about Oklahoma politics since 1982, and I’ve seen a lot through the years from both Republicans and Democrats, but I’ve never seen the sheer volume of needless, extremist bills this session has produced. Kern’s latest measure, House Bill 1412, would prohibit Oklahoma government agencies from adopting any policies that “restrict property rights” that might be traced to Agenda 21, a 1992, non-binding United Nations initiative dealing with sustainability and poverty. Note that it’s “non-binding,” and note, too, that obviously it has absolutely nothing to do with property in Oklahoma. Former Presidents George H.W. Bush, a Republican, Bill Clinton, a Democrat and George W. Bush, a Republican, all endorsed it at some level. The initiative is so innocuous and comes with absolutely no power of enforcement in any country at any time, and it’s so old, that it’s incredibly bizarre that conservative extremists in the national GOP and the right-wing media are getting traction on this hyperbolic stunt. This initiative addresses subjects like promoting walking through the building of sidewalks and safe water supplies, hardly the usual political fare of right-wingers here in Oklahoma. But it’s been jazzed up into some conspiracy about the United Nations. It’s mindless and bizarre. Unfortunately, the bill passed by a 67-17 vote in the House last week and might be considered by the Senate. Some in the right-wing here might see the Agenda-21 hysteria as a way to scare people into voting for Republicans or for ultra-conservative Democrats. In the end, the bill probably means nothing more than that, but it could have harmful, unintended consequences. Agenda 21 is so broad that many basic infrastructure issues could be conceivably tied to it. Both Oklahoma City and Tulsa leaders, in particular, should be concerned that the right-wing in the future could use the bill as an ideological bludgeon. Kern once equated gay people with terrorists and denigrated women and minorities, and she has been a source of embarrassment for the state’s image, but she’s still getting support for her extremism by GOP leaders. For me, this proves some of these leaders, despite the perfunctory lip service, simply don’t care about the state. So much needs to be improved in this state, and this is what Oklahomans get. It’s such a waste of time. It’s sad, tragic, and I wonder how much this dominant Republican era, which will pass into oblivion one day, will set the state back for the long-term in terms of things that really matter, such as education, infrastructure, economic development and health concerns.